Every year Americans use a staggering five hundred million pounds of toxic pesticides in and around their homes, schools, parks, and roads—a growing health risk for people and the environment. But are these poisons really necessary? This book, appealing to the hunter in us all, shows how to triumph in combat with pests without losing the war to toxic chemicals. 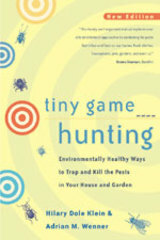 Tiny Game Hunting, written in a lively and entertaining style and illustrated with detailed drawings, gives more than two hundred tried-and-true ways to control or kill common household and garden pests without using toxic pesticides. Hilary Dole Klein is a writer living in Santa Barbara and the author of A Guide to Nonsexist Children's Books (1976) and Substituting Ingredients (third edition, 1994), among other books. Adrian M. Wenner is Professor Emeritus of Natural History at the University of California, Santa Barbara, and the author of books, articles, and a chapter in Comparative Psychology of Invertebrates: The Field and Laboratory Study of Insect Behavior (1997).